Thermal energy is transferred from a region of higher temperature to a region of lower temperature. When bodies are at thermal equilibrium (i.e bodies are at the same temperature), there is no NET flow of thermal energy. Three processes of heat transfer is conduction, convection and radiation. occurs mainly in solids due to its mechanism of transfer of heat. Mechanism: molecular vibration (refer to Fig. 1 for illustration). What is the main process of heat transfer in solids? Explain how heat is transferred from one end of the rod (heated side) to the other end of the rod (non-heated side). Given a metal kettle and plastic kettle, explain which kettle can keep water warmer for a longer period of time. occurs mainly in fluids (liquid and gas) because molecules need to be able to move. there must be difference in density for convection current to take place. In a scenario of boiling a kettle of water, explain how heat is transferred throughout the water inside a kettle. Explain why air-conditioners are usually placed near the ceiling and not on the floor? Explain the sea and land breezes phenomenon. It does not require medium because thermal energy is transferred in the form of electromagnetic waves such as Infrared Radiation (IR). For instance, how the earth receive thermal energy from the Sun. It is just a vacuum out there. Any objects always emit thermal energy and absorb energy radiated from the surroundings simultaneously. However, it can only be a net emitter or absorber at any one time. It is a net absorber if it is cooler than the surroundings, and a net emitter if it is warmer than the surroundings. surface temperature: the higher the temperature of object’s surface relative to the surroundings, the higher the rate of emission of IR. surface area: rate of emission or absorption of IR is directly proportional to the surface area of the object. Given two kettles, one is painted black and one is white/silver, predict and explain which kettle will cool down faster. Explain how the double-walled glass container with silvered surfaces in a vacuum flask help to reduce heat loss via radiation. Why do penguins like to huddle together to keep warm? Silvered thermal blanket given to marathon runner at the end of the race. 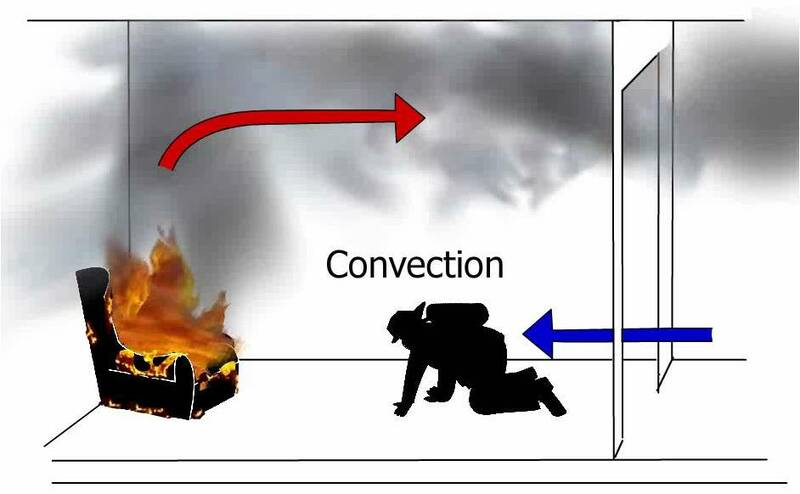 There is a higher chance of survival to stay as close to the floor as possible when there are a lot of smoke due to burning.